One of the bartenders rings the bell, and a unanimous cheer from the crowd rattles the windows. Eight beer taps are thrown open simultaneously as we scramble to shove plastics cups underneath them. One hand yanks the full ones out, while with the other hand we shove the new cups down. We’ve done this before and the pace is relentless. The customers are experienced too, and they know what’s expected . . .
With their own beer secure, customers seated at the bar use a free hand to start the plastic cups moving. Behind them and all around them there’s literally a sea of hands waiting. There’s a row of hands reaching through any open space they can find, and another row reaching out above each seated customer’s head. A third row of outstretched hands reaches over the second row — all those hands trying to grab free beer. Everyone keeps one for themselves (some will take two), but the rest of the tilting cups are being passed all the way to the back of the room. It’s free beer! For the next hour — it’s FREE BEER! With the jukebox blaring, the crowd is loud and raucous, and everyone is having blast. This was my first bartending job, when I managed The Mug in Cortland, NY. It was part celebration, part promotion, but giving out free beer is still one of my craziest bar memories. Several key factors lead up to the free beer — it was a Perfect Storm involving the times, and a unique set of events and people. First, there was my age, and outlook. I was a couple of years past my 21st birthday and still thinking and acting like a college kid. I’d dropped out of school, but I was still living at my frat house, Beta Phi Epsilon. I was running a college bar and on nights off I’d be out at some other college bar, drinking. I didn’t want to miss anything. The second factor was the guy I worked for . . . a man I’ll call Tony G.
Without Tony G, there would never have been free beer. Tony owned The Mug and several other bars in the small town of Cortland, . . . but his real business was pinballs. 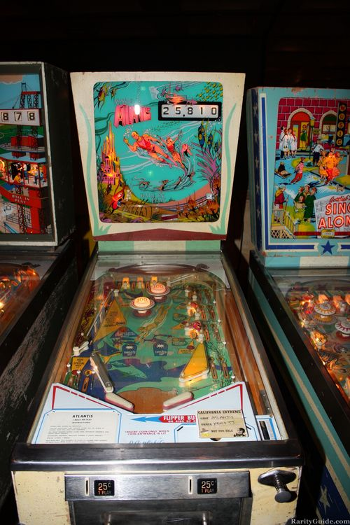 He ran a company that distributed pinball machines, cigarette machines, jukeboxes, pool tables . . . anything with a coin slot that was welcome in a bar. He did so well that if some owner was going out of business, Tony would buy the joint just to keep his pinball machines in action. That’s why he’d purchased The Mug. At The Mug, Tony had a cigarette machine against the wall when you first walked in, and on the right there were four large arcade machines where you could simulate being a race car driver, or a submarine captain trying to blow up ships. On the side wall there was a row of six standard pinball machines. There was a foosball machine in the middle of the front room, a jukebox between the men’s and ladies’ room doors, and a pool table in the back room. That’s fourteen machines with coin slots, and on weekends the college kids would feed their quarters into these machines all night long. There was never a moment that these machines were not in use, as quarter after countless quarter was dropped into them. Yup, Tony did very well with his pinball distributorship. And what did this mean for me, as the manager of one of his bars? Listen to this . . . when Tony first asked me to take over the place, he told me that all he wanted was to break even on the bar. That alone is ridiculously sweet for any manger, but when The Mug actually began to make money, . . . when there was a mound of twenties left in the safe at the end of the month, Tony was ecstatic. From that point on, I could do just about anything I wanted. The staff and I never paid for a drink, and sometimes our friends didn’t either. “It‘s good for morale,” I told Tony. Once, I gave everyone in the place a drink on the house just because Cortland State had won a big lacrosse game. That’s when I decided to give out free beer to everyone, starting with the clang of a bell. I knew I could do this without costing Tony a dime. I’d order 15 kegs the first week, holding off on my free ones, and then order fifteen kegs each week for the next two weeks . . . until the fourth week when I’d collect all my bonus kegs. By that time it was 9 free kegs of beer. Every fourth week, the deliver was free. Now Tony loved me, and he didn’t even blink when I told him that I’d be pouring free beer for an hour every time the Cortland State lacrosse team won. That was the fourth factor in this Perfect Storm of circumstances — the free beer was to celebrate college victories. 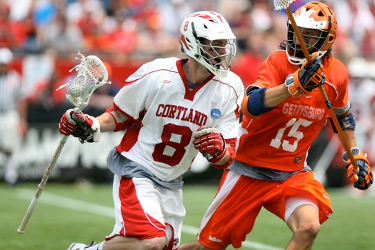 Cortland State always had great lacrosse teams, and that year they were beating some of the NCAA Division I giants — teams like Penn State, Navy, Cornell, and Syracuse. A lot of my Beta frat buddies were on that team (like three-time NCAA All-American Paul Wehrum, Rocky Conte, and Paul Cody) — and others were guards at the games, or worked the ticket table. The previous year, all the bars downtown were packed after each home victory, but because The Mug was at the far end of Main Street it hadn’t been as busy. That’s why I decided to do a free beer promotion. I had my fraternity brothers hang the sign on the front of the table where they sold tickets to get into the game. It was madness at the bar after Cortland won. We waited until the crowd was whipped into a frenzy anticipating free beer, . . . and then we rang the bell. I saw one kid with his eyes closed and a big smile on his face, holding his beer high in one hand. Trapped in the crowd — spinning slowly in a circle as everyone squeezed by — he was enjoying all those young coed-bodies pressing against him. It was madness until the bell rang again, and the hour was over. I remember the floor shaking as the crowd stomped and cheered, applauding what had just taken place. That year we gave away free beer after every Cortland State lacrosse victory — fifteen of them in all. It’s something I’ll never be part of again — at this stage of the game, that’s the last thing I want to do . . . run a college bar. Where would I find an owner as flexible as Tony G, . . . or a salesman’s promotion where the bar gets one free keg for every five that are purchased? Nope, . . . for me it was a one-shot deal, an odd merging of the times with a unique set of events and people. It’s not going to happen again, not in any bar I work at now, and that’s probably a good thing. But I do have to say, at that time and place . . . serving free beer was a blast. (Editorial Afterthought): According to GoDaddy’s statistical analysis, this post drew more visitors than any I’d previously written — readership immediately TRIPLED. I thought this blog was going viral! I was just about jumping up and down! 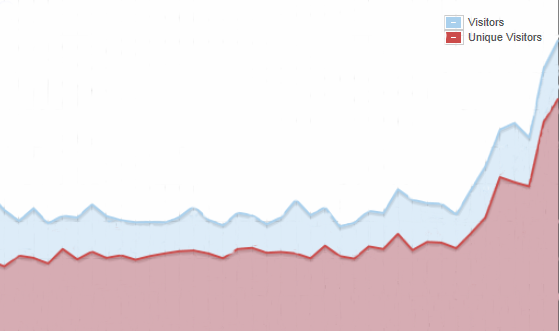 Then I figured out what was behind the sudden popularity. Read that story here –> “FREE BEER, part two (A moment in the sun”). 12 Responses to FREE BEER! Dude, you took me back to the good old days. Ah what memories, I could smell the stale beer. Loved it. Whoa, wish I could have been there. Celebrating the home town win with free beer sounds like the balls. Good post. Case: It was a blast, wasn’t it Case. Definitely the good ole days. Starbucks: Yup, it was the perfect merger of a lot of unique circumstances. Thanks for saying hello, my friend, as always. The brilliance of it is that it went beyond free beer. You marketed to people who loved Cortland that you loved Cortland too. In fact, you loved Cortland so much that you gave away free beer. This meant that you loved Cortland more than the other bars. So if you are looking for a bar and love Cortland, why not go to the bar that loves Cortland the most. You were far more of a marketing genius than you know. You made me wish it was possible to go back to those days. I was smiling all the way though this week’s post. Keep up the good stories. You surely can tell a great tale!! Llylak: I knew it! You’re a club/restaurant person at heart, Lly. There was something wrong with my “comment” software. I think it’s fixed now . . . let me know. If you have a problem, please go to “Contact us” and send me an email. Sorry for the inconvenience. Joshua: I was smiling all though the writing of this post, Joshua . . . some great times for sure. 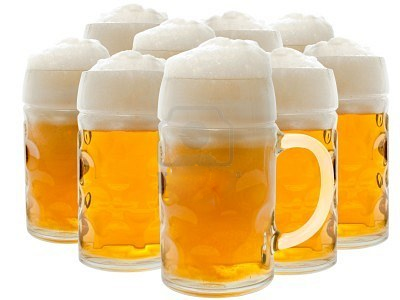 ¨Free Beer at the Mug¨has a nice ring to it – What an experience!